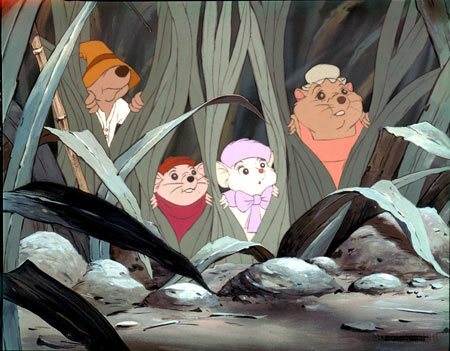 In THE RESCUERS, join the shy but brave mouse Bernard (Bob Newhart) and his glamorous partner Miss Bianca (Eva Gabor) - two tiny heroes on a great big mission to save Penny, a young girl who has sent an urgent call for help. Taking off on the wings of the albatross Orville, together they soar to the marshy swamp of Devil's Bayou. There, they find themselves on the riverboat hideout of the hilariously evil Madame Medusa, who wants to use Penny to steal the world's largest diamond! 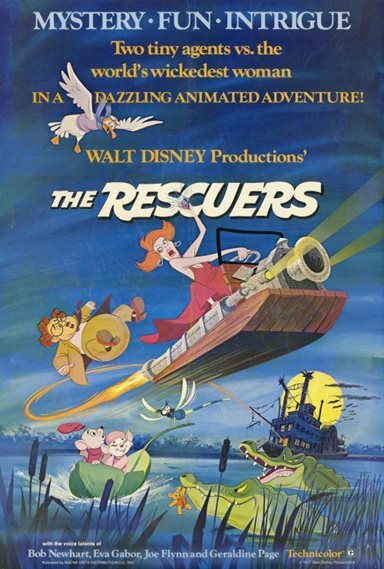 Download The Rescuers in Digital HD from the iTunes store. The Rescuers images are © Walt Disney Pictures. All Rights Reserved. Based on a series of books by Margery Sharp, Disney's 1977 animated feature The Rescuers continued that success with a film that perhaps seized on a topic that was just right for them – a quaint and charming adventure involving mice. The story follows the Rescue Aid Society, an international organization of mice based in New York that mirrors the United Nations, their cause being responsible to always help people in need, especially children. In this particular adventure the nervous RAS janitor Bernard (Bob Newhart) and glamorous Miss Bianca (Eva Gabor) are sent to rescue a young orphan girl named Penny (Michelle Stacy) being held captive in Devil's Bayou by the treasure hunting Madame Medusa (Geraldine Page) who's using Penny to help her hunt for a priceless black diamond. 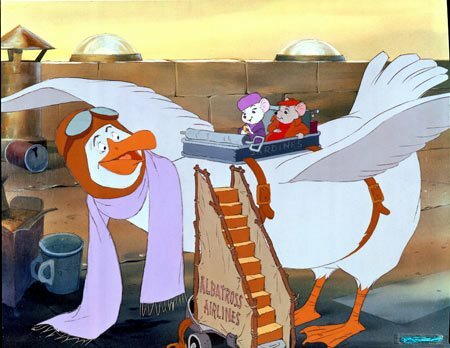 The Rescuers as a film is perhaps a peculiar yet pleasant mix of elements from its time period. It has the rougher look of early Disney animation from the time. The songs on the soundtrack also reflect that mellow, 70s mix that at once seems at odds with the film's adventurous spirit while accurately reflecting the emotional mood of the characters and era. The Rescuers Down Under (the sequel to the first film) wouldn't see release in theaters until 13-years later. By this time, Disney had gone through major changes and was already heading into an upswing again. It was wedged in between 1989′s hugely successful The Little Mermaid and the mammoth Beauty and the Beast of 1991. It couldn't possibly attain the sort of success it possibly deserved being overshadowed by those two films while also being a sequel. The animation style is also different again. The newer, cleaner, more vibrant style that would define Disney hand-drawn animation of the 90s and beyond is employed here. Some of the charm of the original is gone. It just seems bigger, bolder, and, more obviously aimed at younger audiences, a flaw with much Western animation that just can't seem to be overcome without becoming puerile, which makes matters worse. Still The Rescuers Down Under is good film. It brings back the pair of cute adventurer mice, Bernard and Miss Bianca with both Bob Newhart and Eva Gabor reprising their roles, and sends them on a wild adventure in the Australian outback to rescue a young boy named Cody (Adam Ryen) and a rare eagle and her eggs from treacherous poacher Percival McLeach (George C. Scott). While Scott as McLeach never reaches the level of scariness or memorability as a villain in Down Under as did Geraldine Page as Madame Medusa in the original, all the action and adventure is maintained here, even if this particular trip does seem to drag just a bit more in places than The Rescuers did. Disney has recently released as a 35th anniversary collector's edition containing both films. The transfer of video and audio holds up well, especially in the sequel while exploring some of the more vibrant scenery of the Outback. As for special features, there isn't much here, but what is on the disc is of a very high quality, worth owning and worthy of repeat viewings. Peoplitis a deleted song, an animated short, Water Birds: a half-hour live action documentary following the life of waterbirds around the world. A sing-along-song, and a documentary about the making of the film. 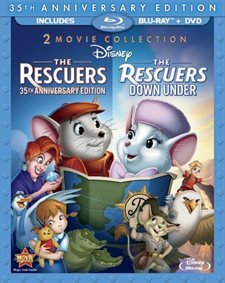 A strong pairing from the "house of mouse" of two feature films that both offer good levels of entertainment, The Rescuers: 35th Anniversary Edition and The Rescuers Down Under are two of the few Disney original/sequel pairings where there isn't a huge drop-off in quality. The Rescuers images © Walt Disney Pictures. All Rights Reserved.